(Airtel, Aircel, Vodafone, MTS, BSNL, MTNL, Tata, Reliance & Idea) Multiple channels for delivery of your messages. Our Sales Agents guide you as you set up and start using our services. Enjoy Extended support from our developer community for Integrations. Fastest delivery for your messages in the country. Experience Instant delivery like you may not have seen before. Personalize your messages on the go, say good-bye to excel formatting and uploading huge files. Get instant insights in to your messaging. We deliver to more than 225 countries in matter of seconds. Get started as soon as formalities are completed. Send your customers wishes on festivals and on their birthdays and anniversaries to keep make them aware your care about them. Keep reminding that they should come back to you as they are important for you. Now send personalized messages to your customers in just few clicks. If you are a Dietician you cans end your patients personalized diet charts and health tips according to their needs by using our grouping contacts feature. Execute time bound marketing campaigns by offering your customers discount coupons for a particular time period to track the effectiveness of campaign and attract as much customers as you can. E.g., if you are a beauty parlor, send discount coupons to your customers during Indian festivals like Karwachauth or wedding season so as to grab more and more customers. Retarget your audience and increase the ROI on your campaigns with our platforms. Send short links in the message or e mails and track the information like the end users mobile numbers who have clicked on the link, track their location, time , handset and browser. After tracking the said information segment the data accordingly and retarget again with more refined audience. Planning an advertisement on hoarding in your city or radio / television and want to generate leads for your business. Short code is the right choice for you then. The five-digit number, very easy to remember and recognize will give a perfect image to your brand as well as will gather huge amount of leads for you. The reports will be available on real time basis and can be forwarded further to your CRM. Enjoy the power of automated surveys with a combination of our call tracking, missed call and reporting solutions. Segment your customers on the go and prepare repeat messaging easily. Why mTalkz is India's Best Bulk SMS Service Provider? SMS marketing is quite an effective way to approach mobile users all across the nation. It helps to make them aware of the products and services. Sending messages or texts is more flexible than calling and e-mailing. What is the use of sending BULK SMS? Bulk SMS is the fastest mode of communication to send the data to the interested client on a specific number. BULK SMS are the fastest way to connect with the user. Business is all about creating contacts and providing affordable services to the contacts. Over the years, the business framework has changed, and so are their strategies. Be it an individual or any organization, BULK SMS makes it easier for the user to stay in touch. Can text message marketing be automated? Absolutely. Businesses can schedule the day and time that their text message marketing campaign is launched. What are the types of SMS Marketing? 1. Transactional SMS- these messages are only for those customers who get the information about their Bank transactions only. The bank sends Bulk SMS in which they mention the specific information about ATM services or Internet transactions. 2. 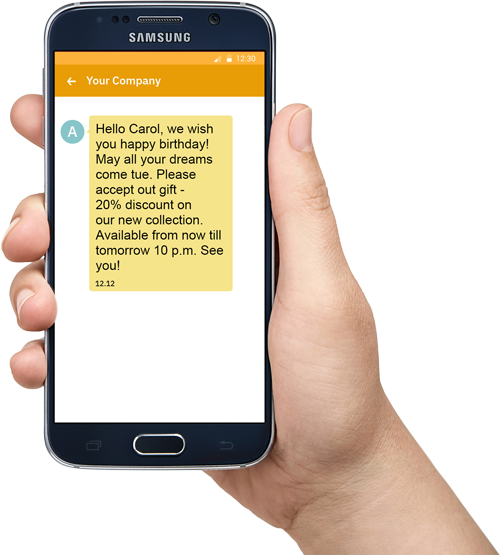 Promotional SMS-these messages are intended for promotions, branding or any event that is happening, the customer receives SMS on their mobile phones. Can text messages be customized? Yes. The number of messages has the provision to personalize as per the choice to include the customer’s name, order status and even a specific landing page on a website. Are these SMS's expensive to bear? It is absolutely depending upon what Packages you have opted for. It varies with the plan, starting at just $5 for 25000 SMS. We make sure that our customer must get the best and reliable services. How does SMS API work? Application Programming Interface (API), a language which enables codes to send or receive the bulk SMS to anyone across the globe. SMS API has been developed in different languages (PHP, JAVA, .NET, RUBY, HTTP) to fulfill the wanted results. SMS API has secured a tremendous impression in different verticals. Right from the leading generation to campaigning the political party, this technology played a vital role. Sending personalized bulk of messages to increase the conversion across multiple channels, has become an easy task for the service providers.